Chinese athlete Chen Qi claimed the title of men's javelin throw of the 17th Asian Athletics Championships on Sunday afternoon in the Jordanian capital of Amman, grabbing the seventh and last gold medal for China at the championships. Chen Qi ranked first with 78.07 meters while two athletes from South Korea, Park Jae-Myong and Chung Sang-Jin, grabbed silver and bronze medals respectively with 75.77 meters and 70.95 meters. Before attending the medal awarding ceremony, Chen said he felt not very good at the beginning of the competition, but he adjusted himself to focus on the event. "During the event I managed to control myself and focused on the competition, which made me winning the title," Chen said. Chen, 24, had always been leading the event during the competition before Park made a throw of 72.72 meters at the fifth try, which is two centimeters more than that of Chen's fourth throw and imposed threat to Chen's title. 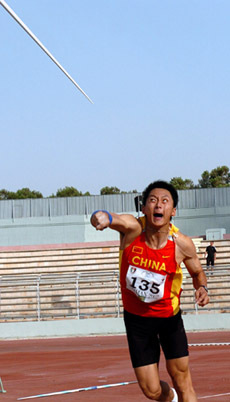 However, Chen had a throw of 78.07 meters at the fifth try, which ensured him the gold medal. The Asian record was set by Japanese athlete Kazuhiro Mizoguchi with 87.60 meters in 1989 and the championships record was set by China's Li Rongxiang with 82.75 meters in 2002.